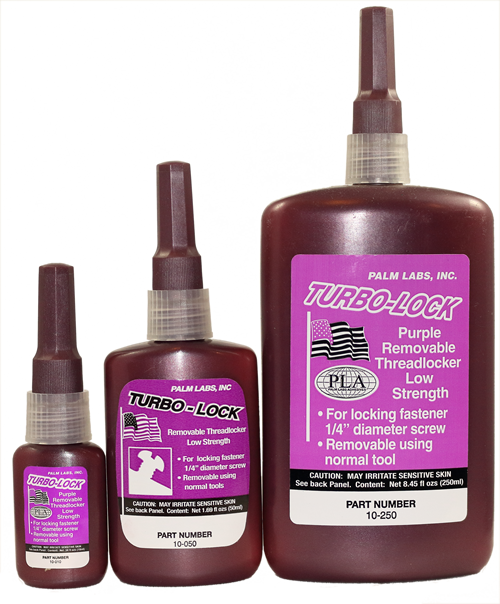 TURBO-LOCK SERIES 10 Purple Removable threadlocker is a low strength removable, fast curing, anaerobic thread-locking compound for bonding and sealing small screw threads. This threadlockier is highly resistant to heat, vibrations, water, gases, oils, hydrocarbons and many chemicals. Disassembles easily with hand tools. Small screws up to ¼". Notes: Our Turbo Lock Purple Low Strength Removable Threadlockers is specifically suitable for applications such as adjustment of set screws and small diameter fasteners, where easy dis-assembly is required. Use threadlockers to secure bolts and screws All 10ml and 50ml bottles come with Nozzle and Brush Dual Dispensing System. Loctite 22205 is a 0.5 ml capsule.